Earning his fortune through shrewd financial speculation, he has spent billions of his own money funding human rights projects and liberal democratic ventures around the world. In recent years, that funding has made him a target of the world's nationalists and populists, who have painted him as a master-manipulator of democracy. Much of the criticism aimed toward the 87-year-old has been criticised as having anti-Semitic undertones. Born in 1930 in Budapest to a Jewish lawyer father, he and his family survived Hungarian Nazi-occupation by splitting up and acquiring forged papers that disguised their religion. He emigrated to England aged 17, achieving an undergraduate degree and PhD from the London School of Economics (LSE) while working part-time as a railway porter and nightclub waiter. While there, he studied under philosopher Karl Popper, who is best known for his rallying cry for Western liberal democracy in the post-war years. His concept of "open society" would be deeply influential on Mr Soros's ideology and financial career. After initially working in investment banking in London, he emigrated to the United States in 1956. He spent time at several firms in New York, before founding his own hedge fund in 1970. Soros Fund Management, which would eventually become the Quantum Fund, was known for its aggressive investment and high returns for investors. The firm gained notoriety for its short-term and flexible speculation on global financial markets. This success made Mr Soros one of the world's wealthiest men and cemented him as a legend within the investment market. He became known "the man who broke the Bank of England" in September 1992, when he made about £1bn betting against or "shorting" the UK's currency, the pound. On 16 September, a day dubbed "Black Wednesday", the Treasury rapidly lost billions in reserves, forcing the pound out of the European Exchange Rate Mechanism (ERM). 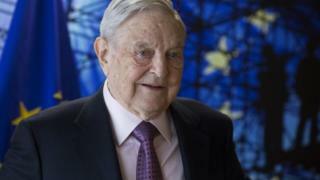 This investment gamble is probably Mr Soros's best known, consolidating his reputation as the world's premier currency investor. His financial single-mindedness later led to accusations that he had helped to engineer the Asian financial crisis of 1997 when the Thai baht collapsed, triggering widespread financial contagion across the region. At the time, Malaysian Prime Minister Mahathir Mohamad hit out at "unscrupulous profiteers" and called for "immoral" currency trading to be banned. Mr Soros drew his ire in particular, but other investors had made even heavier bets against the Thai currency than his firm had. The hedge fund manager began to ease away from the day-to-day control of his firm during the 1980s and 1990s, paying more and more attention to philanthropic ventures instead. Since starting out offering scholarships to black students during the apartheid era in South Africa, he has spent billions supporting progressive free-market projects around the world. He focused on opening up cultural exchange with Eastern Europe during the collapse of communism, before widening investment to other regions around the world. Mr Soros's Open Society Foundations (OSF) now has programmes in more than 100 countries around the world, and 37 regional offices. The organisation says its focus is to build "vibrant and tolerant democracies whose governments are accountable and open to the participation of all people". In 2017, while he was ranked as the 29th wealthiest person in the world by Forbes magazine, it emerged that he had transferred $18bn (£13.5bn) or an estimated 80% of his personal wealth into the organisation. According to his website, his goal is to use his financial independence to fight some of the world's "most intractable problems". The OSF continues to support a number of human-rights initiatives around the world, including campaigns in favour of LGBT and Roma rights. Mr Soros has remained extremely vocal about world economics and global politics. This has drawn flak from 21st Century nationalist politicians, who have depicted him as a left-wing bogeyman of sorts. In Europe, he openly criticised the handling of the euro debt crisis, while during the peak of the region's refugee crisis he pledged generous backing for aid groups supporting migrants. Long read: Who is Viktor Orban? This policy in particular has set him on a collision course with Prime Minister Viktor Orban in his native country. The Hungarian government even funded the distribution of giant posters vilifying the financier in 2017. Mr Soros' foundation eventually decided to withdraw its offices from Hungary, blaming an "increasingly repressive" environment. Image caption Hungary's largest Jewish organisation labelled the propaganda campaign as "poisonous"
His foundation has also donated hundreds of thousands of pounds to the Best for Britain group, which aims to halt the UK's departure from the EU. This support has made him a focus of criticism for pro-Brexit supporters, campaigners and newspapers within the country. In 2015, the foundation was banned in Russia, which labelled it as "undesirable" because of its perceived risk to Russian security and constitutional order. Mr Soros has been a large donor to the US Democratic Party. He backed the presidential campaigns of Barack Obama and Hillary Clinton, and has also labelled US President Donald Trump "an imposter". They have alleged that he was involved in recruiting crowds for the anti-Trump Women's March and even organising violence in Charlottesville to undermine the country's political right-wing. Such conspiracies, and negative coverage of his foundation's work, are often accused of being anti-Semitic, echoing Nazi-era conspiracy theories about Jewish bankers plotting to create a "new world order". George Soros has been married three times. He had two sons and a daughter with his first wife, German-born Annaliese Witschak, whom he married in 1960. The pair divorced in 1983, when he then wed second wife Susan Weber. The pair stayed together until 2005, having two sons during their marriage. He married third wife Tamiko Bolton - 42 years his junior - in 2013. Away from hedge funds and philanthropy, Mr Soros has also dabbled with investing in sports teams around the world. In 2012, it was reported that he had purchased a significant minority stake in UK-based football team Manchester United.